Cleans out your fuel system's tank, lines and injectors, in addition to removing water, lubricating the fuel pump and injectors, plus coating the tank and lines with a rust and corrosion inhibitor. Recommended for ALL diesel engines, but contains anti-oxidants and is not formulated for use in gasoline engines. Extremely effective in middle distillate fuels to improve combustion and ignition efficiency, enhance fuel economy and maintain fuel in a clean stabilized condition. 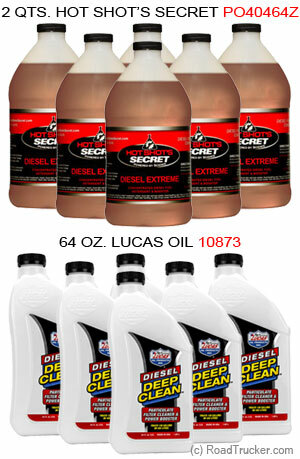 Safe In All Diesel Engines: Semi-Trucks, Pick-Up Trucks, Farm Equipment & Autos. Including But Not Limited To: Ford Powerstroke, Dodge Cummins, GM Duramax, Saab, Volkswagen, & Audi. Recommended Frequency: Use one treatment of Diesel Extreme every 6 months. Reduces particulate filter maintenance (regens) by causing the fuel to burn much cleaner, which eliminates much of particulate matter that normally hits the exhaust system. Plus, It helps clean out the matter, that is trapped in the filter, which reduces exhaust backpressure so the engine can run easier and cooler.